Are you a researcher in search of books for completing your research paper or book? Are you slapped with a deadline too? Welcome to the world of research- a lot of data to be accessed in too little time! In the good old world, researchers would take their own sweet time and visit libraries and sit for hours and days to sift through the data and information available in several volumes. Moreover, how many libraries will you be able to visit? Making time to visit library and hunt for a single book for weeks is a luxury and a thing of the past. Some libraries may be located in different countries altogether. Not a viable option, is it? Guess what, suddenly, the world has changed. Everything we held dear has gone online, including access to books. Now you search for books online and scanned/ebooks are all you need. However, it is trickier searching for books online. A plain Google search for ebooks on the topic of your research may not yield desired results. You may get a lot of ebooks that you DON’T want! Let’s say you are working on the correlation between economic growth and employability. You want to access the Congress records/reports wherein there’s data and statistics regarding the economic conditions prevalent in the US. You want to access Fed documents to study the policy initiatives from time to time. In addition, you want to access early issues of journals which are available only in JSTOR. Typically, you will search for this in Google in different ways and you will access different websites of the kind mentioned above. However, you will search a lot and find a little which is of value with respect to your research. This is where a site like Archive.org comes into play. What’s Archive.org and how can it help researchers? In layman’s terms, Archive.org is a non-profit library of millions of free books, audio books, movies, software, music etc. from where you can get all the books and other media you want. Whether you are looking for ebooks, audiobooks of Harry Potter or some Urdu books, you can find it all here. All the documents our particular researcher who needs related to Congress, Fed and JSTOR back issues are easily available at Archive.org! The problem, however, is that you have a timeline for your research and you are running short of time even for reading and analyzing the data. Add to this the time required for penning down the findings, and you have a perfect recipe for panic! If you manually try to download the books and other media you need from Archive.org, it will take ages. All you hope and pray for is some way to access and extract the books you want in an automated fashion. Here’s the good news: you can use web scraping tools to access and extract books and other media for your research. Rest assured, it will be quick and work like magic! Wondering how you can do it? But before you plunge right into web scraping for Archive.org resources, you must come to terms with the challenges of manually accessing the said resources and how web scraping is not an option but a necessity. Of course, you know how difficult it is to extract the books you need from Archive.org. But it would be good to understand the technical difficulties in layman’s terms and the reason why web scraping can be such a great advantage for a researcher! First of all, there are millions of books and other resources as mentioned earlier. As much as it is a treat for the researcher, it also poses a big challenge to sift through the maze of millions of books and access and download the ones you need. Secondly, when you search with a key word, Archive.org, it will generate hundreds of pages with books and other resources for you to consider for download. It’s obvious, you cannot visit each page one by one and see what each page contains. Even if you embark on this laborious task, you cannot even hope to complete it before the turn of the century! For each topic/subtopic, you can get at the most 50 book results per page and at the most 200 pages. In other words, doing this manually is not only a nightmare but also inadequate for your research purposes because you will not be able to access the docs you want or may not even be able to choose the right books you need. 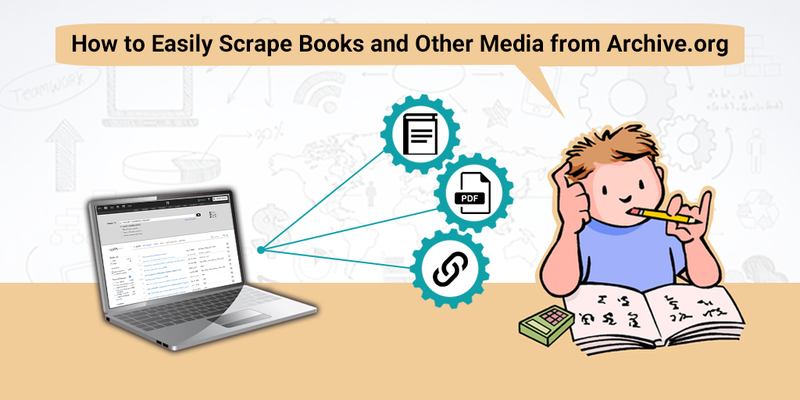 These are the reasons precisely why web scraping can help you extract the books you need in bulk in an automated fashion. With web scraping, you will not need to invest your valuable time and energy on manually downloading it as the process will become automated. In no time, you will be able to access the books you need in a hassle-free manner. Next, we need to configure scraper to open each URL from the collection from the step 1, and fetch the URL of PDF file of the book. Scraper is smart enough so that you just need to do sample configuration for any one book; it will do the same job for rest of the books and collect all PDF URLs. After configuration of the Scraper, you just need to click Start and then once the process is done you will be able to download all Books PDF URLs and other information in single CSV file. In this way, you can extract the books and other media that you need for your research through web scraping in easy and simple steps! Have you got any such requirement for scraping books for any pending research assignment? If you are working against a deadline and if you need help, please feel free to contact ProWebScraper for scraping books and other media from Archive.org or any other similar site!